It has been said that where Metroxylon sagu grows, nobody ever goes hungry. It is an important plant economically grown throughout tropical Asia as a source of edible starch accumulated in its stem in large amounts. An impressive palm with new leaves in brilliant red and has one of the largest flowers in the plant world, up to 7.6 m from the top of the palm, signalling its impending demise. Botanical Name: Metroxylon sagu (syn. : Metroxylon inerme, Metroxylon longispinum). 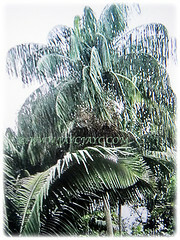 Common Names: Bataua Palm, Seje Palm, Pataua Palm, Ungurahui. Etymology: The genus Metroxylon is derived from metra, meaning pith and xylon, meaning xylem. 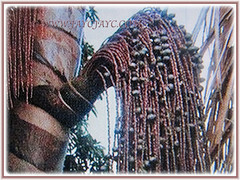 The specific epithet sagu is the name of the palm tree from which starch is obtained from the piths of palms. Origin: Native to Thailand, Indonesia, Malaysia, Philippines, Papua New Guinea and Fiji. 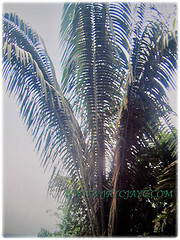 Plant type: An evergreen and perennial palm tree. Features: Metroxylon sagu is from the genus Metroxylon that consists of ? species of palm trees. It is a multi-stemmed, large and clustering palm that sports a robust trunk below a crown of gracefully ascending deep green and pinnate leaves. New leaves are brilliant red in colour. Each trunk in a cluster, flowers only once and dies after producing thousands of golfball-sized and scaly fruits, only to be quickly replaced by a new sucker. The erect and cylindrical trunk grows between 7-25 m tall before it ends in an inflorescence. Before flowering, a stem bears about 20 pinnate leaves up to 10 m long. Each leaf has about 150-180 leaflets up to 175 cm long. The inflorescence, 3-7.5 m tall and wide, consists of the continuation of the stem and 15-30 upwardly-curving branches spirally arranged on it. Each first-order branch has 15-25 rigid, distichously arranged second-order branches. Each second-order branch has 10-12 rigid, distichously arranged third-order branches. Flower pairs are spirally arranged on the third-order branches, each pair consisting of one male and one hermaphrodite flower. The fruit is drupe-like, about 5 cm in diameter, covered in scales which turn from bright green to straw-coloured upon ripening. 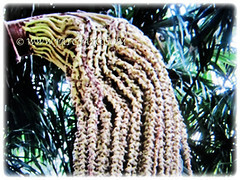 Culture (Care): Metroxylon sagu or Sago Palm can be grown easily with least maintenance. Soil: Humus-enriched, sandy, loamy, heavy clay and moist soils. 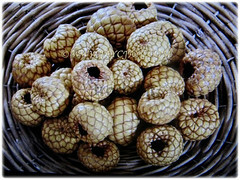 Others: Best to cut down the stem shortly before the tree flowers, since the carbohydrate content is then at its highest. Use extreme caution when handling as the plant has spines or sharp edges. Once every quarter, feed the palm with a slow-release granular fertiliser formulated for palms that has nitrogen, phosphorous, manganese and potassium. Generally, it is free from serious diseases and pests. 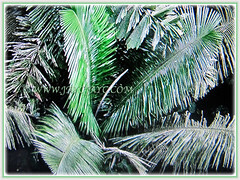 Metroxylon sagu or Sago Palm may not tolerate 1°C for prolonged periods. It grows best in areas where annual daytime temps are within the range 25-36°C but can tolerate 18-40°C. When dormant, the plant can survive temperatures down to about 10°C. Propagation: Easily propagated by collecting and replanting young suckers rather than by seed. 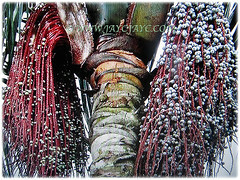 Usage: The tree of Metroxylon sagu or Sago Palm is of commercial importance as the main source of sago. This starch is used in cooking for puddings, noodles, breads and as a thickener. Pancakes made from sago are often eaten with freshly caught fish. Its leaflets are also used as thatching which can remain intact for up to five years. The dried petioles are used to make walls and ceilings. 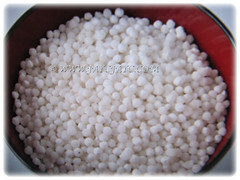 They are very light and therefore also used in the construction of rafts. The waste from pith processing is used as a fertiliser.